Christine Isborn is a theoretical chemist that I recently worked with to create a web site. I think it came out pretty well. Go check it out! Full disclosure: Christine is my girlfriend! Since returning from my trip to Australia and New Zealand, I have been pretty busy seeing as many people as I can before I leave town for good. On the evening of Monday, the day I got back, I went running around Greenlake with Theo. I went around twice, for about six miles. I’m not fast at all, but I did the whole distance running, I survived, and now I’m sore… but for my first run since the Seafair triathlon I consider it a success. Tuesday, I slept in, worked on getting pictures off of my cameras and starting to organize them, and then ate dinner with Hoyin and Alice at Pearl at Lincoln Square. I stayed up way too late working on pictures afterward, but I have a few awesome stitched panoramic photos for the effort. Wednesday, I woke up in time to go to Cedars in the U-District for lunch with Dennis. Next, I arranged Thursday dinner with Maria via phone and then I then swung by the CSE building at the UW to arrange lunch tomorrow with Ciara. So today is pretty booked for food, but I certainly have time between meals to see others… so if you are a Checksum Arcanius reader that I haven’t seen yet, let me know if you want to meet up before I bounce out of town. Alternatively, you can visit me down in Palo Alto whenever you wish! Friday, Jon and I played basketball at Greenlake, I got a call from Christine, and Jon and I headed to Kerry Park with Spencer, Christine, and Erik, where I took some pictures (to be posted later). Saturday, I drove to frisbee with Bobby, Spencer, and Theo. We played until about 1:00, then went to Portage Bay for Brunch. That afternoon, Vince and I got together to work on a final paper for the class we’re taking together. We finished up at 4:00 am. Sunday, I woke up around 11:30 — missing the CSE canoe trip — but I was double booked with a bike ride anyway, and Theo was flexible, so we rode 35 miles to my parent’s house. I can’t climb hills with Theo’s bike — I have no idea how he goes anywhere on that thing, honestly. He handled Cougar Mountain with relative ease on my bike, though. I clearly need to work on my climbing. Tomorrow is my last day of class. Wednesday is my last day of school-related duties. Friday is my graduation party (contact me for details). Saturday I graduate. Sunday I leave for Peru. For a long time I’ve had the colorful Facebook Friend Wheel on my Facebook profile, but I was always a little unimpressed with its grouping mechanism: Although it was generally pretty good, it always put a few friends in totally the wrong place, it seemed. 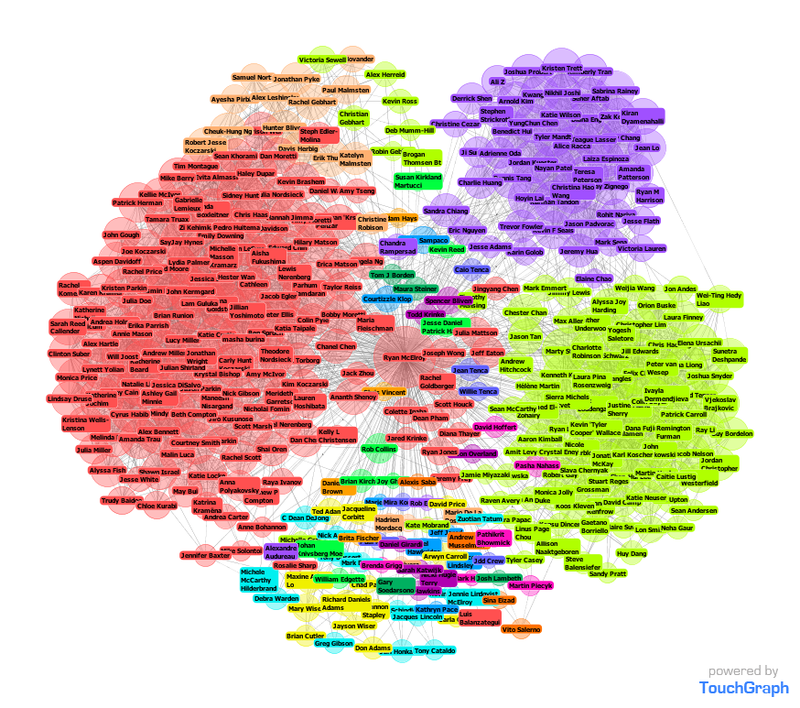 Recently, I became interested in finding a better way to vizualize the mutual-friend relationships among my many facebook compatriots. The two best applications that I’ve found so far are Touchgraph Photos and Nexus. 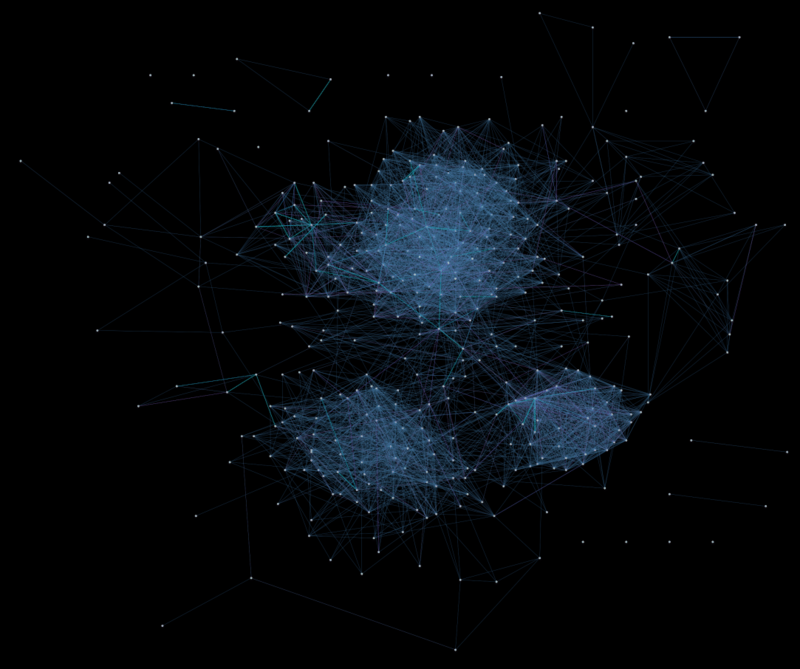 Each node can be dragged around, but with this many nodes it is slow and not very effective at moving groups around. I also noticed that some mutual friend connections are missing, which is the most perplexing part of this application. Nevertheless, it is pretty cool: IS kids are on the left in red, CSE kids are on the right in yellow-green, and BioE kids are in the upper right in purple. You can see the same three groups in this rendering: IS kids are the top cluster, BioE kids are the bottom-right, and CSE kids are the bottom-left. On Thursday, the Silicon Valley tech company Palantir came to the UW to give a “Tech Talk,” a self-promotional display of technology used to get CSE students interested in working for the company. The talk is usually accompanied by food and, sometimes, raffle prizes. I decided to attend because I figured I would be hungry around 5:30 (definitely true), and I had heard lots of good things about the people at Palantir and what they were doing. The food, as it turns out, was pretty good — we got to make our own tacos, and I greatly appreciated it. However, I had a 6:30 class, and was unable to stay until the end of the talk, which I heard went until about 7:00. This is where it gets interesting. At the beginning of the talk, the Palantir folks passed around a cup into which we were to drop our names to win a fabulous iPod touch. Being all about gaming the system, I decided to enter my name several times — six or seven times, that is — using varried sizes of paper. Furthermore, I went around with the cup, allowing other to place their names in it, before placing my own names into the cup, to give me a superior placement within the cup. Apparently my techniques were effective — very effective. In fact, I won the raffle. Or at least, my name was drawn first. However, because I had to be present to win, and instead I was attending my 6:30-9:30 Programming Languages lecture, I did not actually win. So they placed my name aside and drew again. And then my name was drawn, again. I still was not present, so I still did not win. Finally, someone who was present did win, and the raffle ended. It seems that my actions grated on at least a few people, although the student who reported the incident was “nice” (?) enough to omit my name, while nevertheless accusing me of having no integrity. I decided to thank him or her for the post, and take full responsibility for my actions in a comment to the post.